Sarez Lake - Freshwater of Sarez Lake can supply the Asian region for a long time but has a bit threat to Central Asia. Our task to change this natural hazard to natural the source of life. Lake Sarez, deep in the Pamir mountains of Tajikistan, was created 100 years ago when a strong earthquake triggered a massive landslide that, in turn, became a huge dam along the Murghob River, now called the Usoi Dam or Sarez Lake. In the early 20th century exactly in the winter of 1911, a huge rockslide in the Pamir Mountains of southeastern Tajikistan completely blocked the Murgab River creating a huge "natural" dam creating a big hazard doiwnstream. That river tributary reaches to Amy Darya River Basin. Before that disaster, there was a village named Usoi and then the Landslide entirely buried that village. Now in most literatures, it is known as a Usoi Dam. That landslide has a total volume estimated at approximately 2 km3, with a maximum height above the original valley floor of 500-700m. By passing time a lake quickly formed behind the Usoi dam, rising at a rate of around 75m/yr during the first few years. In most references it is referred by two names, one is the Usoi dam and another one is Sarez Lake. At the beginning, the name referred to the landslide that buried the Usoi village then it named after that village. When the level of water rose it drowned another village, Sarez, that was behind Usoi. After that, the second name and most widespread, Sarez Lake became most common. According to the wide range of observation from national and international experts, the hazardsand risks can be divided into several classes. b) Impact on regional residential areas. c) Afghanistan Government protest due to the threat of Lake Sarez. Among the central Asian countries, Afghanistan was the first country to raise the conflict on the regional scale. We report some arguments from the representative of the Minister of State for Disaster Management and Humanitarian Affairs of Afghanistan Wais Ahmad Barmak. whop said than an investigation by Afghan experts indicates that the spillway was a matter of great concern and Afghanistan is trying to take the necessary measures to avoid the possible dangerous outflow from the dam. In addition, he explained that: “The recent reports about the dam are a serious concern. We will, therefore, continue our efforts to address the problem. However, so far we don’t have more information about the state of the dam”. 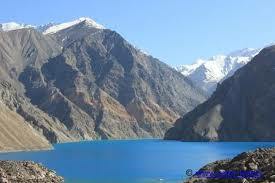 Afghanistan side pointed out that the statistic about Sarez Lake are frightful. According to the Afghan ministry of water and energy, Tajikistan’s Sarez Lake currently holds more than 16 billion cubic meters of water. The ministry warned that if the dam’s capacity was exceeded, the outflow will raise the level of water in the Amu River. Meanwhile, the office of the chief executive officer has called on vulnerable countries to coordinate to avoid possible threats from the dam. They criticised that, there is not any benefit from this lake at all. “The Afghan government is in contact with aid groups to solve the problem,” the Chief Executive Abdullah Abdullah’s deputy spokesman Jawed Faisal said. No country has benefited economically from the Sarez dam, but the ministry of water and energy has warned that more than five million people who are living around the Amu River will be affected if the dam collapsed. It is said that not one of the countries located around the dam, has the capacity to evacuate people from the flood waters from the dam should a disaster occur. But there is no any response from Tajikistan as a host..
Project Details After that terrible strong tremor felt in the Bartang river at deep midnight (at 23:15) on February 6, 1911 immediately, the scientific circles of what would be the Soviet Union after 1917 (Tajikistan was part of SU) began exploring the stability of the new dam and a probability of a catastrophic flood from the growing lake. It is worth noting that forecasts - both favourable and terrifying – were made not only by scientists and experts but also by people with little in common with the problem. Hereby we name some important figures that had done some work in this area, among the early investigators of Lake Sarez are the names of P. Zaimkin, G. A. Schpilko, D.D. Bukinich, I. A. Preobrazhenski, V. S. Kolesnikov, O. K. Lange, V. A. Afanasiev, V. I. Razek and many others. According to UN/ISDR findings, there are two options exist with regard to the Lake Sarez issue. Firstly – the newly formed dam is unstable and a catastrophic flood from the lake is a probability involving all the imaginable consequences. The second one – the Usoy dam is a natural stable structured and the lake will stay quite a long time similarly to other conformable lakes: Yashilkul Lake in the Pamirs, Iskanderkul Lake in Central Tajikistan and many others. However, there rarely trigger a massive landslide. For instance, "on August 22, 1987, a huge rock fell into the lake 12 kilometres from the Usoi Dam," Mamadloikov says. "The 18-million-cubic-meter rock fell into three pieces, creating a wave of 16-17 meters all sides of the lake. The level rose 3 to 4 meters [at the location] where the geological station stands. countries – Tajikistan, Uzbekistan, Turkmenistan, and Afghanistan (5 million people under this dangerous disaster). Hence, Tajikistan's budget does not allow the government to provide the major investment required to completely eliminate the threat caused by Lake Sarez. That is likely to leave Tajik authorities, residents, and interest groups looking to the international community for the kind of financial support that might help avert a disaster in the shadow of Tajikistan's Pamir Mountains. Special equipment for monitoring the situation around Lake Sarez in eastern Tajikistan is now being installed by a World Bank project working on risk mitigation in the area, a step to ensure early warning for the vulnerable population in the region. "This equipment is for monitoring the situation around Lake Sarez, the dam and the Bartang valley, including seismic activity, landslides, water, wind speed and so on," Rustam Bobojonov, a coordinator for the World Bank's Lake Sarez risk mitigation project, told IRIN from the Tajik capital, Dushanbe, on Thursday. His comments followed the recent procurement of a special satellite monitoring and early warning system worth some US $1.5 million, now being installed in the area. Recently there was news that Open Joint-Stock Company (OJSC) Orienbonk, which is one of Tajikistan’s largest commercial banks, has an agreement with Heaven Springs Dynasty Harvest (HSDH) Group of Hong Kong on launching a joint venture on processing and selling water of Lake Sarez. But still Open Joint-Stock Company (OJSC) Orienbonk officially is not certifying that they are in cooperation of harvesting water for drinking usage from Sarez lake. PR Newswire noted that Tajikistan takes one of the leading positions in the Central Asian region as well as throughout the world on the reserves of water resources, where Tajikistan owns 65% of them in the Central Asian region and Sarez Lake is the world's highest and largest barrier lake located in Rushan District of the Gorno-Badakhshan Autonomous Region (GBAO) of Tajikistan. Mr. Dato' Sri Baima Aose has reportedly met with Minister of Foreign Affairs and Minister of Economic Development and Trade of Tajikistan to discuss cooperation. The representative of Orienbonk say they cannot comment on reports posted on Heaven Springs Dynasty Harvest Group’s official website, but they deny reports that the bank allegedly concluded an agreement with Heaven Springs Dynasty Harvest Group on establishing a company for processing and selling water as absolutely unfounded. In future, we will see how this projects will act in terms of fulfilment of their plan to use a gigantic source of water fro Sarez lake. The way of realizing their plan needs to take into consideration the hazard and the local benefit from the project of selling the water. The threat of the Lake Sarez already exist but the launching enterprises on processing and selling water of Lake Sarez is still under the course of negotiations and discussion. Relevant government actors Central State of the government of Tajikistan. Tajikistan's Committee for Emergency Situations. Other Forest, croplands, and garden will be destroyed. Also, natural reserves (Zapovednik ) are threatened by dam failure. Other loss of money in bank and valuable documents. Development of Alternatives The governmental institutions and the central state are setting up a plant to negotiate we the countries that are suffering from a freshwater deficiency. Governor of GBAO and Tajikistan figured out that the only way of reducing the hazard is to sell the water to dry region for irrigation purpose and to supply the residence with fresh water. In addition, to apply some of the UN sustainable development goals in terms of access to fresh water, reduction risk in under disaster areas and life security, the concerned organization from all scale can take it as a vital issue and fulfil their responsibility. Why? Explain briefly. Due to the lack of financial support the central state is not able to make any suitable approach to tackle this issue. Stakeholders are trying to find out a way managing a plant to offer on the global scale, in order to hook the international agencies to support them. They claim that it is a regional matter and the dangerous region of the neighbor countries should contribute their effort. UN SDR 2000. Usoi Landslide Dam and Lake Sarez. An Assessment of Hazard and Risk in the Pamir Mountains of Tajikistan. Путеводитель по Памиру. Полный фильм. ♔ PAMIR TV - 24♔ Озера Сарез. Горячая Точка. Sarez Lake Freshwater of Sarez Lake can supply the Asian region for a long time but has a bit threat to Central Asia. Our task to change this natural hazard to natural the source of life.